Asher was born December 8th 2015, at 36 weeks gestation, weighing 9 lbs 10 oz. He was delivered by c-section due to macrosomia. He was immediately under close watch for fear of macroglossia. Asher was taken directly to the NICU, where I later found out, his first blood sugar was under 10! The NICU team at Virtua placed a central line through his belly button and began administering D50. They spent 3 tiresome days trying to stabilize his blood sugars, with no such luck. They decided to transport Asher over to the Children’s Hospital of Philadelphia. While at CHOP he was immediately diagnosed with Hyperinsulinism. It’s mind blowing how something so perfect on the outside, was so broken on the inside. On December 22nd (2 weeks old), Asher went in for his PET scan. The results came back that he had focal lesions on the head and body of his pancreas. They planned surgery for a week later, hoping to only take out about 50% of the pancreas. A week later, and he is in the professional hands of Dr. Adzick and it was time to beat this disease. The surgery lasted just about 4 hours,and Dr. Adzick had to remove 98% of the pancreas. The entire organ was affected. 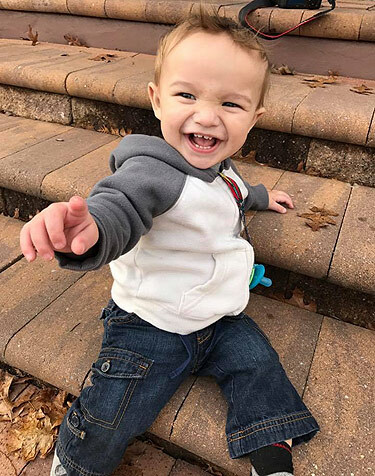 Along with the pancreatectomy, Asher had his appendix removed, multiple biopsies done (he was physically diagnosed with Beckwith-Wiedemann Syndrome), and he had a g-tube placed. Genetics from the pancreatic biopsies showed dominant mutations in the ABCC8 gene. A month more of recovery, and upper GI series, we were finally going home. Even though Asher was still experiencing some fits of hypoglycemia, he was sent home. He came home on a continuous flow of D20 through his g-tube. We spent the next 5 months in the feeding program at CHOP as well as multiple Endocrine visits. He also was being seen by early intervention for low gross motor skills. During this time, we were informed that, even though he physically showed signs of BWS in the beginning, he genetically did not have it. In June, Asher was again admitted to start Octreotide. He spent a week in the hospital and was then sent home on 2 shots of Octreotide during the day, and continuous D20 from 9pm-9am. We are very grateful for the injections, with a little boy who is ready to move, it comes in handy not being tethered to a tube! With his HI under some sort of control, we then had to deal with his enzyme deficiency as well as his dysphagia. Today, Asher is your typical one year old little boy! He loves to run around, take baths, and play with his toy cars. He is not letting his HI hold him down. We have been experiencing some good BSLs while on the Octreotide and D20 (we still get that occasional, random low). We hope that he will someday soon, not have to rely on the D20 through the night, so we can get rid of the g-tube. He is becoming more social with family and friends, and all around, enjoying life. We still visit CHOP monthly for different visits. I hope that one day, he can look back at all of this and see how absolutely, SWEET he is!